JNN 19 Feb 2014 Baghdad : Powerful Shia cleric Moqtada al-Sadr, leader of a major political movement and a key figure in post-Saddam Iraq, was a fierce critic of the U.S.-led invasion, chief of a once-feared militia and political kingmaker, has announced his retirement from politics two months before elections. Sadr who wears the black turban as a sign of being “syed ” or descendant of the Prophet Mohammad PBUH , gained widespread popularity in the months after the 2003 invasion of Iraq. His rise, aided by the reputations of two famed relatives – including his father, Grand Ayatollah Mohammad Mohammad Sadiq al-Sadr – Martyred during Saddam Hussein’s rule, eventually translated into political power. The decision, if confirmed as permanent, brings to a close a political career that began with his fierce opposition to the U.S. military presence in Iraq, and has spanned more than a decade. “I announce my non-intervention in all political affairs and that there is no bloc that represents us from now on, nor any position inside or outside the government nor parliament,” Sadr said in a written statement received by AFP on Sunday. Ahead of legislative elections in April, Sadr’s movement currently holds six cabinet posts as well as 40 seats in the 325-member parliament. After the invasion which toppled Saddam, Sadr commanded the Mahdi Army militia, which fought fierce battles with American and Iraqi government forces, and he was identified by the Pentagon in 2006 as the biggest threat to US Forces . The Mahdi Army – estimated to have had up to 60,000 members – was once the most active and feared armed Shiite group in the country, and was a sign of terror for the takfiri’s and the Wahabi Terrorist ,working for the Instability of Iraq. But in August 2008, Sadr suspended the activities of the Mahdi Army after major conflicts with the U.S. and Iraqi forces and assaults on its strongholds in Baghdad and southern Iraq. Following the ceasefire, U.S. military commanders said Sadr’s action had been instrumental in helping bring about a significant decrease in the levels of violence across Iraq. He nonetheless continued his vocal opposition to the U.S. military presence in Iraq. Sadr repeatedly called for a total U.S. pullout and threatened attacks if it was not carried out, as Washington and Baghdad held negotiations on a possible post-2011 U.S. training mission that was ultimately not approved. He also said his movement’s political offices will be closed, but that others related to social welfare, media and education will remain open. It was not immediately clear if the move was temporary or permanent, with Sadrist officials saying they had been taken by surprise and could not clarify. “I do not think it will be reversed… because it is a very strong decision,” the official added. Sadr said the decision to leave politics was taken from the standpoint of Islamic law and of “preserving the honorable reputation of Sadr, especially of the two Sadr martyrs,” referring to his father and another relative who were martyred during Saddam Hussein’s rule. Sadr’s political career began with his fierce opposition to the presence of foreign troops in Iraq after the 2003 U.S.-led invasion of the country that toppled Saddam. His rise was aided by the famed reputation of his father Mohammed Sadiq, who was killed along with two of Moqtada’s brothers in 1999 by gunmen allegedly sent by Saddam, and another relative, Mohammed Baqir, who was executed in 1980. Moqtada’s movement subsequently gained both seats in parliament and cabinet posts, and played the role of political kingmaker. Sadr suspended the militia’s activities in 2008 following fierce battles with Iraqi and U.S. security forces. He left the country at the end of 2006 or the beginning of 2007, according to U.S. and Iraqi officials, and reportedly pursued religious studies in the Iranian holy city of Qom. Sadr returned in early 2011, and then shuttled between Qom and Najaf, his base south of Baghdad. But he showed he could still pull powerful political strings even during his self-imposed exile. After throwing his weight behind Shiite politician Nouri al-Maliki in 2006, ensuring he became prime minister, Sadr then ordered his followers to pull out of the premier’s cabinet the next year, almost bringing down the government. 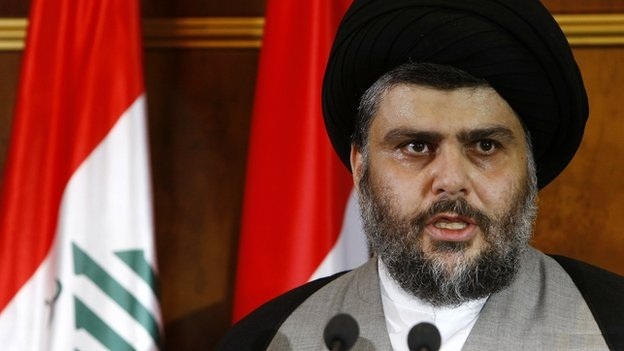 Sadr’s bloc contested the 2010 legislative election in an alliance with the Supreme Iraqi Islamic Council, another Shiite group with its Backing from Iran. Both before and after the U.S. military withdrawal in late 2011, Sadr was a sharp critic of Prime Minister Nouri al-Maliki, despite ultimately backing his selection as premier in both 2006 and 2010. In 2012, Sadr was among Iraqi politicians who called for Maliki to resign, and said his MPs would vote to sack the premier if needed. But Maliki ultimately weathered the crisis, and Sadr’s focus has increasingly shifted to religious studies. This entry was posted in Iraq News and tagged Grand Ayatollah Mohammad Mohammad Sadiq al-Sadr, Iraq, Mahdi Army, Saddam Hussein. Bookmark the permalink.